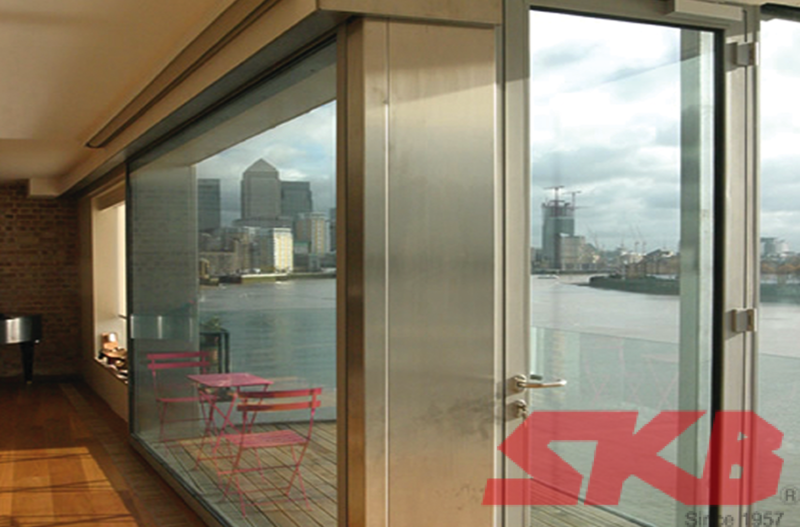 The SKB Steel Doors are designed for fuss-free maintenance; smooth and low noise; and modern designs for commercial and residential properties. It also reduces noise and heat transfer from the outside. The steel door frame is strengthened using heavy duty aluminium frames to ensure reliability and durability. Unlike wooden doors, the SKB steel door are free from termite infestation and require minimal maintenance such as repeat painting works and replacement of hinges due to regular wear and tear of hollow timber doors. With the key message being low maintenance, high quality European hardware and mortised locksets are used to minimise wear and tear, enable easy handling and cleaning. An improved design door edge protection also prevents dent and imbalance on the door when it hits an object or when it is repeatedly shut against the frame. Steel doors are now a popular choice among commercial and residential properties. It is commonly installed in hotel room, bedroom, store rooms, kitchen, studios and car park. Minimal work on installation – The main frame and door panel shall only be installed after the door sub-frame and the plastering of the brick wall gaps are installed and sealed. Choose between different designs of European mortised locksets including stainless steel level handle. Interchangeable lock cylinders and multipoint locking hardware. 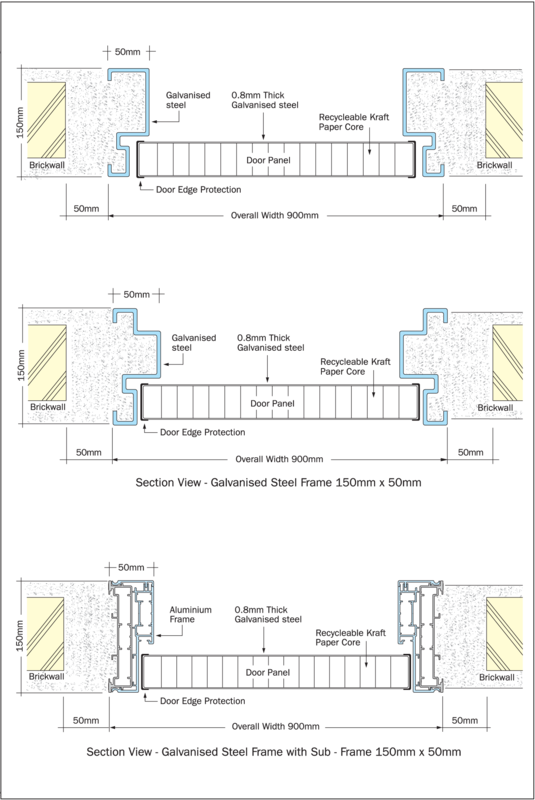 Galvanised steel door frame (150mm x 50mm) – Fabricated from 1.5mm galvanised steel with door bumpers, protection covers for lockset, door closer and pre-threaded hinges reinforced plates. 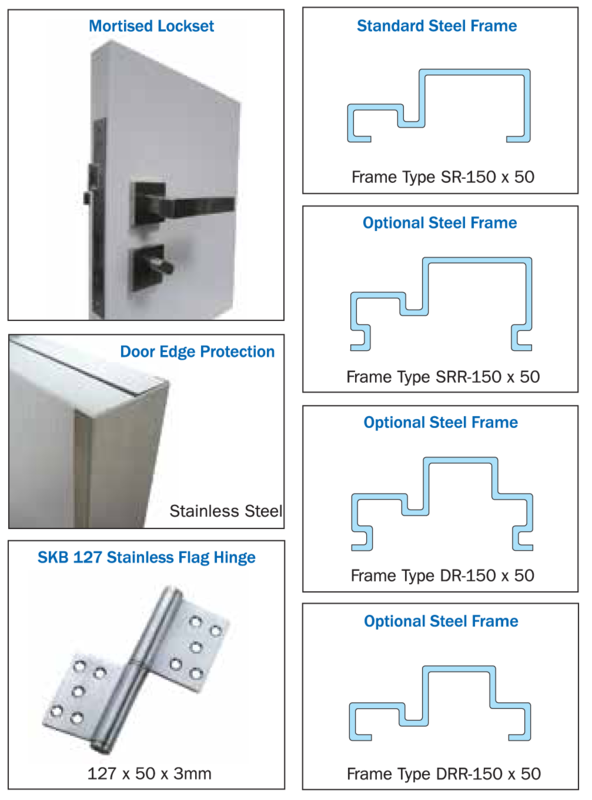 Frame design with single rebate as standard design and double rebates as optional design. Comes with primer spray printed finishing. Aluminium door frame Steel Frame (150mm x 50mm) – Fabricated from extruded aluminium and adapts the sub-frame installation method. Each frame comes with pre-cut backplates for hinges, lockset and closer. Design and installation is in compliance to the current Industry Building Standard (IBS) concepts. Comes with a powder coat finishing. Galvanised door panel – Constructed from 2 pieces of 0.8mm galvanised steel sheets with recyclable paper honey comb core reinforcement. Reinforced back plates for lockset, door closer and hinges are included. Comes with primer spray painted on surface. Branded European-made Mortised Lockset – imported mortised lockset with interchangeable double throw cylinder and easy thumb-turn function internally.